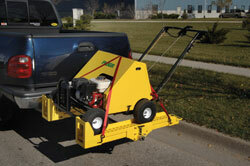 The EZ Haulr can transport most walk-behind outdoor power equipment on any vehicle with a 2-inch receiver hitch. The unit features 300 pounds of total capacity and adjustable-width ramps. It can transport equipment safely with wheel spacing up to 35 inches wide and up to 46 inches front to back. The unit can carry auxiliary equipment on small service vehicles or on the rear of multi-machine flatbeds. Key features include: three-piece construction for easier hitch installation; self-storing, no-slip ramps; permanent front-wheel stops; right-hand or left-hand ramp use; multiple safety pin locks; and a powder-coated finish.